Pelikan seems to have gone with a rather radical business plan for 2015! Not only did they continue their habit of releasing a new Ink Of The Year, they also released a new special edition Souverän M600 in Pink, two new M200 special editions (the Amethyst and the Café crème earlier this year),and not one, but three(!) new versions of the M8xx (2 special editions, and one standard model) were added to the Souverän lineup as well! The year started with the release of the M805 Stresemann, a model that's meant to stay in their regular line from now on. 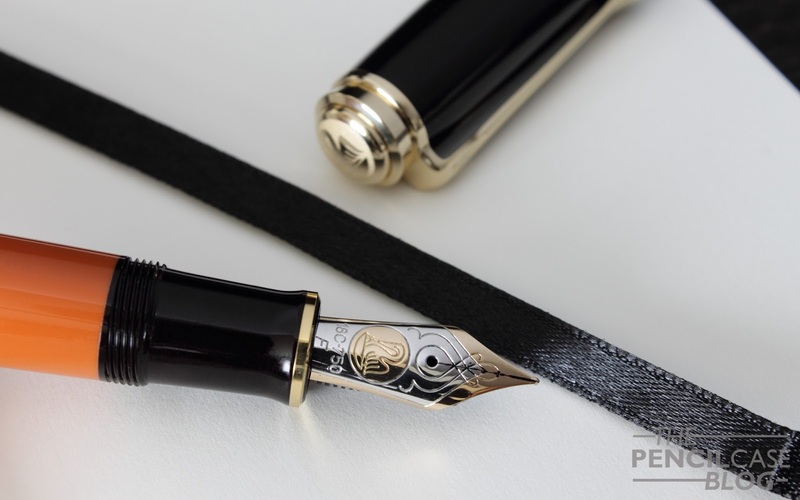 Not much later, Pelikan put the news out of a Demonstrator version of the M805. 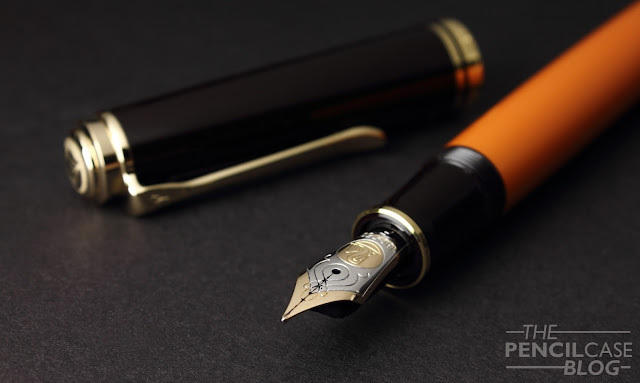 But they didn't stop there... a few months back in September, they released a second special edition for the year: The Pelikan M800 Burnt Orange. 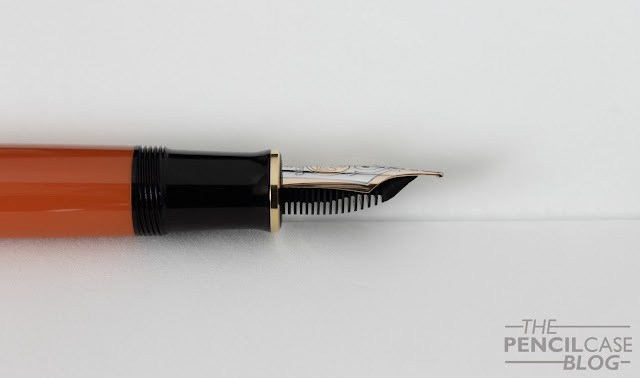 Now I know I've done my fair share of reviews about different versions of the m8xx pens, so to keep things interesting, I'll keep this one short (haha probably not...), and focus on the new design rather than on the nitty gritty details of the Souveran M800 collection as a whole. As you might already know, the M8xx is the second largest pen in the Souverän collection. At about 14.1 (5.55 Inches) capped, it's a comfortably sized pen. It has taken me quite some time to find out wether this one or the M600 is the best all-around size, and I might have said that the M600 is better in a previous post. But I'd like to conclude this once and for all: the M8xx is the absolute best pen in the Souverän collection. Of course it's still a matter of personal taste, but for me the M800 hits that sweet spot of being not too small, but also not oversized huge. 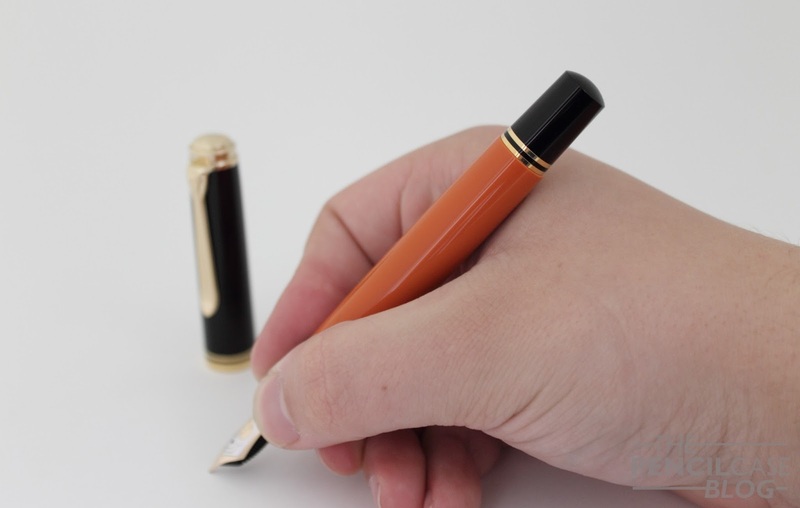 If you have smaller hands, the M800 will be more than long enough unposted, but even if you prefer a larger pen, you'll be able to get away with it unposted. Of course you can always put the cap on the back to get that extra bit of length. It's also a slightly more substantial pen compared to the M600, mostly because of the brass piston mechanism. Yet it's still not overly heavy, at under 30 grams total, it just has a nice bit of heft to it. 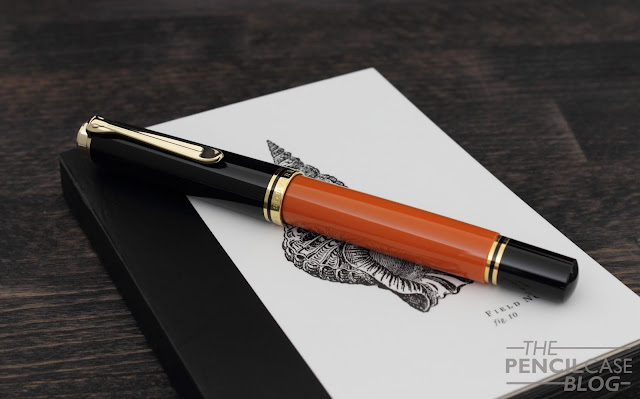 But enough about dimensions, let's talk about the things that changed in this special edition: The Burnt Orange, as the name suggests, is made up out of a 'burnt' terracotta-like orange resin for the barrel. The material is completely opaque, and doesn't have striations of clear resin, or an ink window, a subtle departure from their usual design. A benefit of not having an ink window is that it doesn't break the clean lines of the pen. The obvious downside is that you won't be able to see the ink level inside the barrel. The orange 'main' color is accentuated by, not black, but very dark brown resin parts for the section, cap and piston knob. The difference in color is subtle, to say the least, as it is almost impossible to distinguish it from black if you don't hold it in direct sunlight, next to an actual black pen. Yet for some reason, despite the fact that it's almost not noticeable, it does pair up quite nicely, and give the pen a 'warmer' appearance. I never thought I'd like it this much, but the combination of a warm orange with this dark brown and gold trims really is quite nice, especially for this season! I opted for a fine nib to try out, which is the very first fine I've used on a Souverän pen. Since Pelikan's nibs usually tend to run a bit wider than most other nibs (especially compared to japanese nibs), I expected something closer to a normal medium. However this one -and I don't know if this is a standalone case or not- really does write pretty comparable to a standard western fine. It's a really enjoyable nib: stiff, and with a little feedback, but also very consistent. The flow is very balanced, a bit on the wetter side, but not too much. I know some people complain about inconsistent behaviour of Pelikan nibs, but so far all the nibs I've used were pretty well-tuned, and this particular one is actually one of the best performers of them all. Of course there's always a chance that you get a bum nib, but I certainly wouldn't stay away from the brand just for that reason. 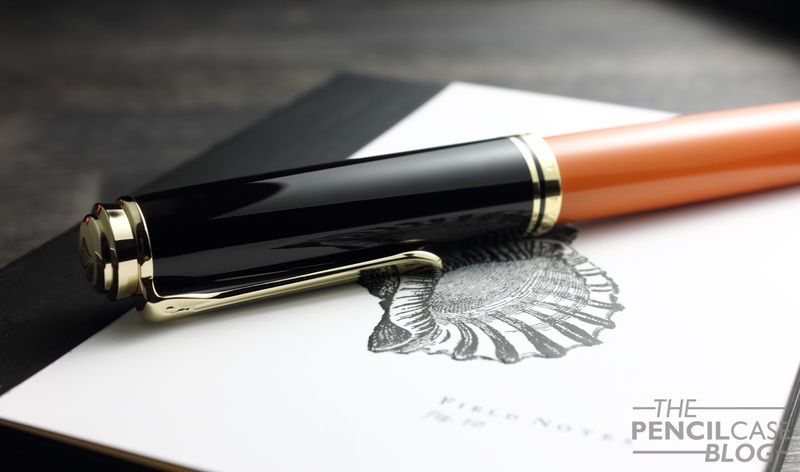 Besides, bum nibs can be found with pretty much every brand, it isn't necessarily a Pelikan issue. 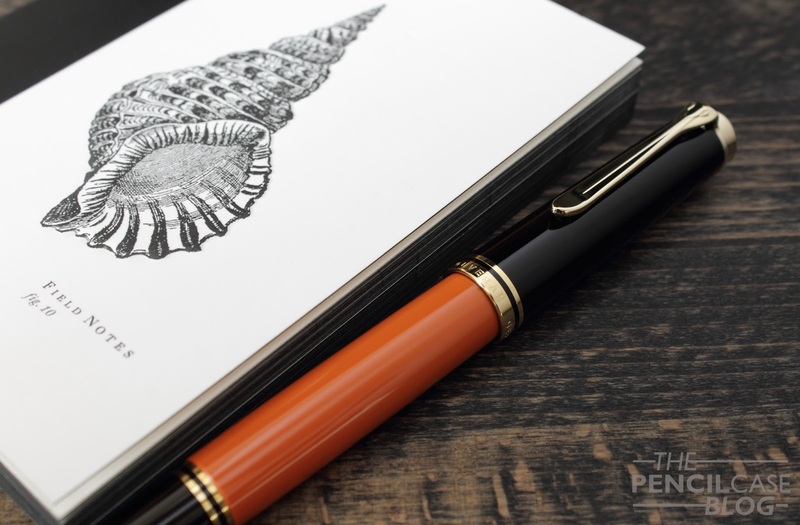 Pelikan has had a pretty busy year so far, but they came up with some really great new designs. The Burnt Orange is definitely a looker, and can still be purchased if you are interested. You'll have to act fast though, because once they're gone, you'll have a hard time getting your hands on one! Retail price runs around the same as the regular M8xx line, at about 495 EUR / 530 USD. 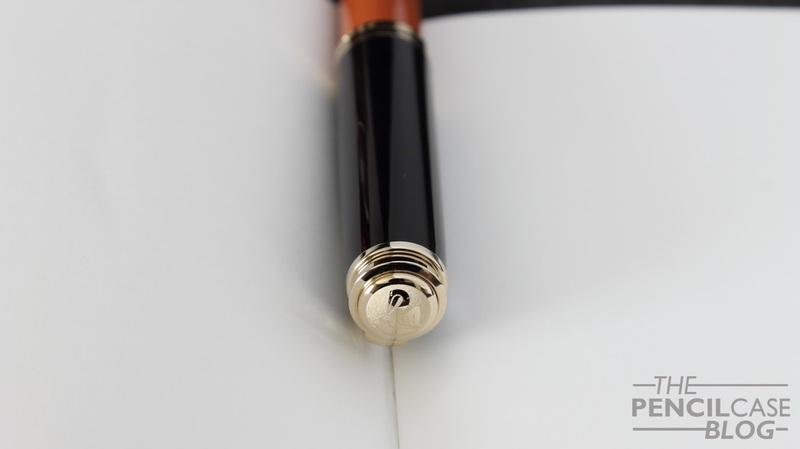 Note: I received this pen on loan from Appelboom pens, so I could write this review. I was in no way influenced in the making of this review, the opinions shared here are completely my own! This review does not contain any affilate links. Great post, beautiful pen. Could you list for me the name or link the field notes you are using? I love that front cover!